In the mid-1990s, Chris Kimball moved into an 1859 Victorian townhouse on the South End of Boston and, as he became accustomed to the quirks and peculiarities of the house and neighborhood, he began to wonder what it was like to live and cook in that era. In particular, he became fascinated with Fannie Farmer's Boston Cooking-School Cook Book. Published in 1896, it was the best-selling cookbook of its age-full of odd, long-forgotten ingredients, fascinating details about how the recipes were concocted, and some truly amazing dishes (as well as some awful ones). 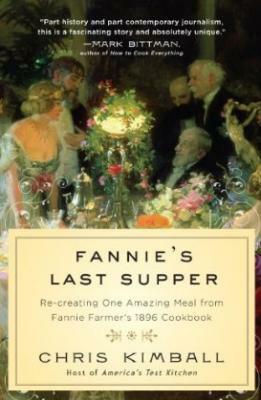 In Fannie's Last Supper, Kimball describes the experience of re-creating one of Fannie Farmer's amazing menus: a twelve-course Christmas dinner that she served at the end of the century. Kimball immersed himself in composing twenty different recipes-including rissoles, Lobster À l'AmÉricaine, Roast Goose with Chestnut Stuffing and Jus, and Mandarin Cake-with all the inherent difficulties of sourcing unusual animal parts and mastering many now-forgotten techniques, including regulating the heat on a coal cookstove and boiling a calf's head without its turning to mush, all sans food processor or oven thermometer. Kimball's research leads to many hilarious scenes, bizarre tastings, and an incredible armchair experience for any reader interested in food and the Victorian era. Fannie's Last Supper includes the dishes from the dinner and revised and updated recipes from The Boston Cooking-School Cook Book. A culinary thriller. it offers a fresh look at something that most of us take for granted-the American table. Chris Kimball founded Cook's Magazine in 1980; it has grown to a paid circulation of 1,000,000. He hosts America's Test Kitchen and Cook's Country, which are the top-rated cooking shows on public television, reaching 2 million viewers per week in over 94% of American households. Kimball is a regular contributor to both the Today Show and the CBS Early Show. He has been written up in most major newspapers, many national magazines including The New Yorker and Time, and regularly contributes to NPR's Morning Edition, including doing a regular Thanksgiving segment. He will also host a public radio show on cooking starting in the fall of 2010.